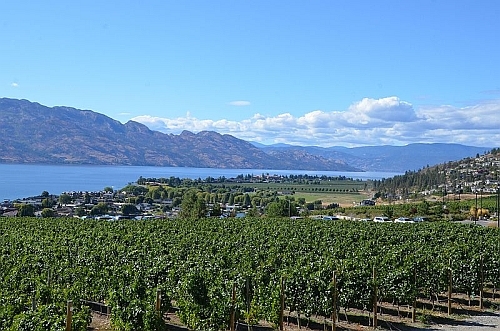 Flair Air (formerly New Leaf) is showing non-stop flights from Vancouver to Kelowna or Edmonton for travel in the summer of 2018 for $98 CAD roundtrip including taxes. And 1 stop flights from Vancouver to Toronto for $298 CAD roundtrip. Vice-versa trips (eg: Edmonton / Kelowna to Vancouver) are also available for $98 CAD roundtrip. For comparison, Air Canada and WestJet are currently charging $388 to $417 for the same summer flights. Yes, for a 90 minute flight! And to top it all off, Flair Air also recently dropped their extra charge for carry-on baggage. Their lowest prices now include both a personal item and carry-on. Update @ 10:17 AM PST - The Flair Air website has been having issues loading, I'm assuming from too much traffic. I've found that if you hit F5 (refresh) in your browser after getting to the blank page, it may load. vancouver, yvr, flight deals, toronto, ontario, yyz, canada, abbotsford, yxx, alberta, north america, british columbia, bc, kelowna, ylw, winnipeg, ywg, manitoba, edmonton, yeg, hamilton, yhm and flair airlines. 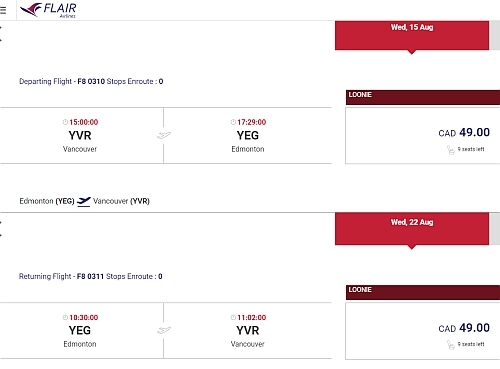 15 Responses to "Vancouver to Kelowna or Edmonton (and vice-versa) - $98 CAD roundtrip including taxes, and Toronto for $298 roundtrip | peak summer 2018 travel"
well, can't seem to access the flair air website.. The Flair Air website has been having issues loading, I'm assuming from too much traffic. I've found that if you hit F5 (refresh) in your browser after getting to the blank page, it may load. I got through! It took many attempts to get from one stage to another, but perseverance is the key. Thank you, Chris, it is an excellent price to Edmonton. No problem Ruth, I'm glad you were able to get through! I'm assuming it will get easier for people to get through the Flair Air website as traffic dies down. I managed to book two tickets to Toronto in June. Awesome... thanks so much Chris! I tried for about 45 minutes and kept getting busy or error messages. Then, a confirmation email showed up with what I'd been trying for. A happy surprise after I had given up. Rubbish site. At it for last 20 minutes. Got half ways and then vanished. Thank you, Chris. Now i get to go to Toronto and visit my family for an unbelievably low price of $300. I did not manage to snag the deal but the flights to Toronto were cheaper than the usual price anyways. Still waiting on a confirmation email from Flair Air - does anyone have experience booking with this airline? How long does it take to get a confirmation email from them? I got to the payment confirmation then it timed out. I spent 40 min on hold with customer service and they said it did go through and my flights were booked. Its been well over an hour now and no email confirmation. They said the email would eventually arrive. Got all the way to the credit card entry and got timed out. Tried again and the seats are over a hundred dollars more. Is the deal from Vancouver to Toronto over? Yep, these are long gone.